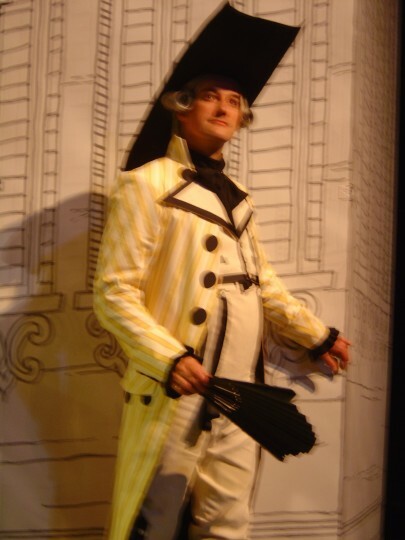 With colourful 18th century costume against a black and white set, reminiscent of a hatched drawing, The Barber of Seville toured to 25 venues across the UK. 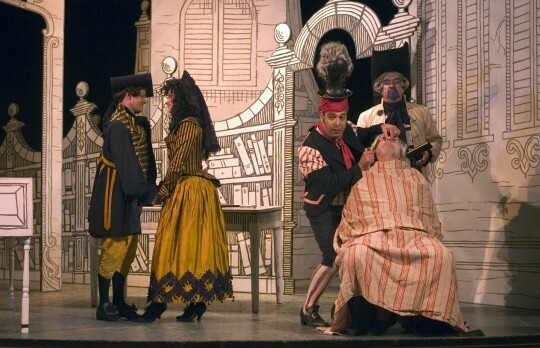 The Barber of Seville was conducted by Fraser Goulding with a design by Gary McCann and Gabriella Ingram. 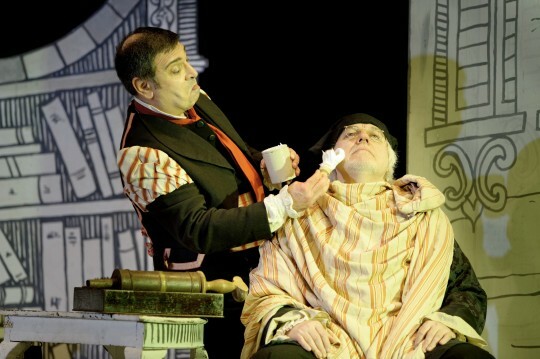 Swansea City Opera’s Barber of Seville is an absolute delight! 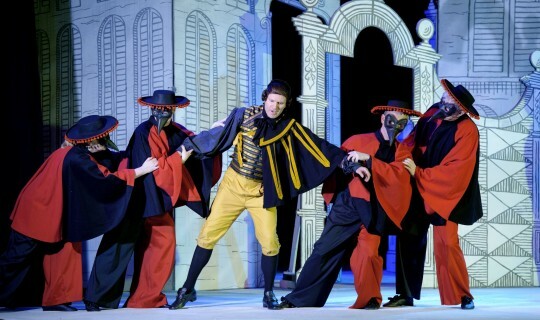 If you want to give someone their first taste of opera, but find ticket prices and long journeys off putting, not to mention impenetrable plots or arty-farty reworking, then you couldn’t do better than to catch Swansea City Opera. They specialise in mainstream operas, with all those well-known tunes sung in English, and best of all they bring them to a venue near you. Although these productions are scaled down for touring purposes they are enriched by a live orchestra. What a treat to hear well trained voices effortlessly filling the Queen’s Theatre, even when singing pianissimo. No microphones needed (am drammers take note). This production looked so good from the outset. 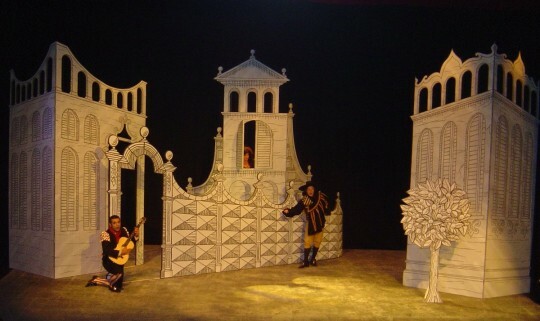 A totally black and white set, seemingly made of architect’s drawings, threw into focus the beautiful costumes, in a limited but bold palette, with lots of stripes and commedia dell arte flourishes. Even props seemed “drawn” on cardboard. The performers threw themselves into the comedy of this complex plot. Fortunately a good libretto meant that we understood every word. 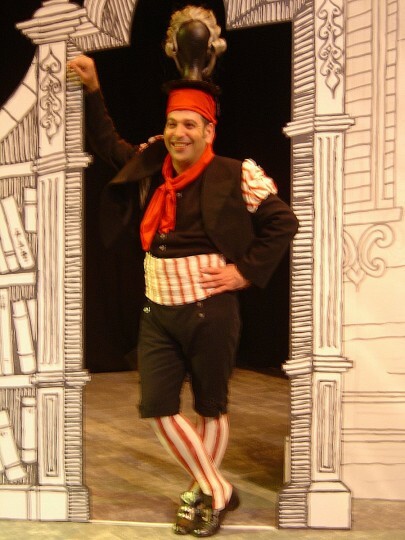 Aris Nadirian made a fine Figaro. His nifty footwork and cheeky chappy good humour instantly got us all on side. And when he sang the famous Largo al Factotum the audience was utterly his. The lovers Rosina and Count Almaviva were played by Jeanette Ager and Arthur Swan. This feisty Rosina has a voice that made the coloratura passages sound easy. Her Count was ardent and earnest, the perfect foil for the comic roles. Experience told in the music-master Basilio (Paul Hudson) who has a deft comic touch; and Brendan Wheatley as Bartolo was so impressive: he even sang part of one aria with a paintbrush in his mouth! The farcical “business” was often very G&S and also had modern references (was it just me or did they do the Macarena at one point?). The result was a theatre filled with laughter. Could Rossini have asked for more? I thought that last night's performance of the Barber was one of the finest that the theatre has put on in recent times. Deservedly playing to a full house (not seen since West Side Story) it was a most professional production contributed to by all, not least the orchestra, and with uniformly strong voices. We badly need theatre of this quality. Phenomenal. I hope Swansea City Opera can come to us again soon. Fantastic players, wonderful (Covent Garden like) singing, great energy and presence. Quite superb! Thank you – please come again. I have been going to opera for probably 40 years in all kinds of venues, by professional, semi-professional and amateur companies. This performance ranked among the best I have seen. The set was lovely, the costumes beautiful and the diction of the singers was impeccable! Please come again! It was great. Good fun, good music, well acted. Viva la opera! 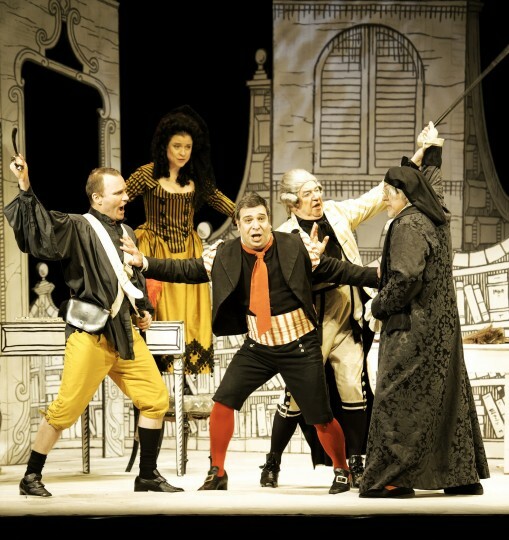 We did enjoy it as an entertainment, having had little experience of opera (Tosca, Magic Flute & now Barber of Seville). Terrific show last night at the Theatre by the Lake: full of brio, panache, pace, and excellent singing. I’ve seen professional opera all over the world, and enjoyed your production every bit as much. Congratulations.